uDAC (pronounced: micro-DAC) is available with each DAC Cartwall purchase as well as separately via this page. This application is designed for use on 7″ USB touchscreens or Windows 8 tablets as a low-profile jingle player, outside broadcasts or for when you can’t justify *another* 19/22″ screen in the studio! The Set files are directly compatible with DAC Cartwall (and my other software) so your existing jingle pages can be used. The Set folder can be defined allowing you to network several uDAC / DAC Cartwall systems for sharing audio between various studios/sites. 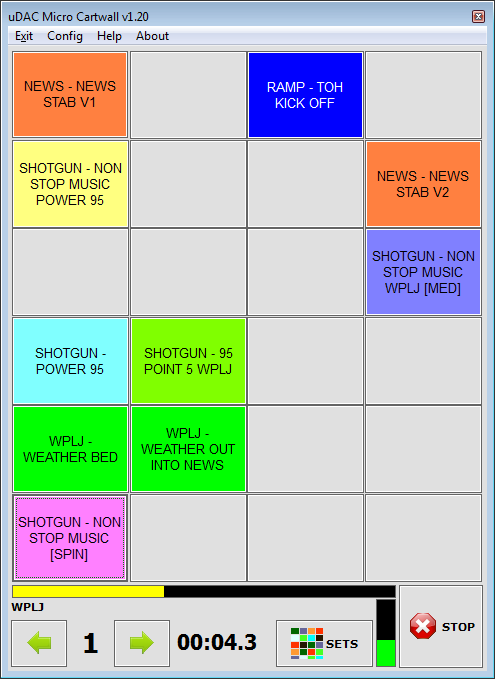 Have as many cart pages/sets as you need – Station IDs, Liners, Promos, Jock Drops and even Sound Effects/News Clips. It can be used standalone or alongside your playout system to give presenters some flexibility to play there own jingles or audio from portable storages. Audio can be loaded from any visible (local or mapped) drive as well as portable memory such as SD cards and USB sticks. Great for bedroom DJs, college/university stations and community radio.